How to grow your edible garden in containers. You don’t have to use fancy expensive flower pots. The plastic tubs sold as wash basins work quite well and cheap plastic serving trays do well to catch drips. First, drill or poke drainage holes in the bottoms of the plastic bowls/tubs with a drill or craft knife. Put down a layer of cheese cloth or window screening, then add about an inch of gravel (the large aquarium gravel is just fine), then fill the bowl nearly to the rim with a Mel’s Mix that’s half compost and ¼ vermiculite, ¼ peatmoss. Pat the soil down a bit. Sprinkle your seeds thinly on the surface of the soil, then take a small amount of compost in your hands and rub them over the seeds to lightly cover them. Water gently with a fine spray so as not to dislodge the seeds. Keep the soil moist and out of the sun for now. When the seedlings are 3 inches high, thin them out and place the bowls in sunlight or under grow lights. Harvest when ready. You can reseed fast growing crops like radishes, basil, carrots, dill, and lettuces every couple of weeks and add a bit more compost when you harvest so you have salad gardens and herbs growing year round. Basils, chervil, fennel, dill, coriander, summer savory, thyme, mint, radishes, carrots, lettuces, tomatoes, all thrive in pots. So do sage and rosemary, but they prefer a little sand in their compost. For greater veggie adventures, you can grow bush beans, chard, cucumber, scallions, radicchio, arugula, broccolini, kale, spinach, Brussels sprouts, and mustard greens in pots with 3 hours of sunlight or grow lights. Beets, broccoli, cauliflower, cabbage, and carrots need 4 hours of sunlight. Tomatoes, peppers, eggplants, squash, and cabbages need 6 hours of sunlight or time under a grow light. 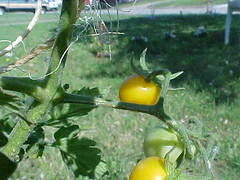 Melons can be grown up trellises with mesh slings to support the fruits – and with 7 – 8 hours of sunlight or grow lights. These require larger pots than the herbs and small veggies, of course, and many require trellises. Combine large, slow growing crops with smaller, faster growing ones. Fill in the spaces between cabbages, cauliflowers, broccoli and other large crops with scallions, radishes, cilantro, mesclun mix of lettuces, and plant trellised veggies in the back of the pot so it doesn’t block sunlight from the rest. If you have your garden on your patio, you may need to protect the tender plants from wind and frost. Pretty room divider screens can block winds if they are placed so they don’t block precious sunlight. Screens with decorative holes in them large enough to allow sunlight through yet small enough to dampen the eager wind are good choices, and making wind screens of translucent fabrics can be pretty and effective. Cloche coverings are traditional to use to cover tender plants when the nights get frosty in early spring and late fall. These are usually made of clay or glass, but I find lampshades work every bit as well and add a touch of whimsy to the potted garden. Lampshades can be purchased at garage sales and flea markets in many sizes and recovered with old shower curtains. The bottoms of the shower curtains may be moldy and ragged, but the part up near the curtain rings is usually still in excellent condition – and it doesn’t matter if the holes are ripped out. Also, tomato cages can be trimmed to fit over pots (upside down!) and covered in bird netting or mesh to keep birds from harvesting your fruits. These are easy to lift off when you’re ready to harvest, allows the plants to get their sun, and keeps them safe from marauding feathered thieves. Me, I generally plant a few for the birds and then I don’t feel so bad about keeping the rest for myself. Potted plants need more moisture because the wind dries them out more. I like to wrap the clay pots in peat moss to help hold in moisture, and set up low wind screens. Clustering pots close together helps reduce some of this, and using mulch on top also helps prevent drying out. Putting small birdbaths among them with water or setting up small fountains among them will help keep them moist, too. The “shower” or “mist” setting on a sprayer nozzle is best to use on container plants because it’s less likely to dislodge the soil or disturb the roots. Mel’s mix, heavier on the compost in a ½ blended compost - ¼ vermiculite - ¼ peat moss blend is best for potted plants, and they will need diluted organic slow-release fertilizer throughout the growing season. Potatoes are a special case. I like to grow mine in large 30 gallon yard clean up bags because the bags are sturdier. Just cut a couple of drainage holes in the bottom of the bags, roll the sides down so at least 2/3 of the bag is rolled, then fill the bottom third with about 4 inches of the modified for containers Mel’s Mix. Cut your seed potatoes so there’s one “eye” per piece, and let the cut bits (called chits) dry for at least 24 hours. Plant your cut potato chits eyes up in the bag – 5 chits per bag – 1 in the middle and 4 around. When the plants get to be 6 – 8 inches tall, roll the sides of the bag up enough to top the bag’s soil with either more soil or straw (I do soil for the first 2 roll up and sometimes first 2, then straw after that). Do this each time until your bag is filled up. Let the plants bloom and wither at this point, Once the leaves have turned brown, it’s time to harvest. Just slit the bag open and let your potatoes spill out. Brush off the dirt and remove the underground shoots, then let the potatoes air dry out of the sunlight for 2 – 3 days. Wash the potatoes only when you’re ready to use them. You can also grow some plants “upside down” – tomatoes do well, as do cucumbers, peppers, nasturtiums, strawberries and any trailing herb. Peas and beans are interesting when grown “upside down”. You need special equipment to grow them this way. It’s really cheaper and easier to just buy the Topsy Turvey or Babylon Grow Bags because they come with all the hardware and special holding equipment that will keep the plants from falling out of the bottom of the bag. If you want a more permanent container and money is no object, you could use the Upside Down Garden. These all need lots and lots of water – a gallon a day each, and they are heavy so they will need very sturdy stands or supports from which to hang. Plywood and drywall are far too weak to support these plants so don’t even try to hang them from those. If you’re in an apartment where you can’t put in hooks, these deck stands work well. Using hanging space as well as containers will give you more growing room in a smaller space. If the area is shady, light can be supplemented with grow lights. Leafy plants need at least 3 hours of sunlight a day, root plants need 4 – 5 hours of sunlight a day, and fruiting plants need 6 – 8 hours of sunlight a day. The more light they get, of course, the better they’ll grow, but you can get decent crops even from minimal light. Remember, container grown plants will need more water and more fertilizer than plants grown in raised beds or the ground. They will need windbreaks and frost protection. If you have to move them for sunlight, they will need wheels of some sort. On the plus side, they will be less likely to have bugs, will be easier to harvest, and you’ll have your own food supply close to hand.